Verrocchio, a favorite artist of the Medici, may have created this lively and commanding portrait on the occasion of a joust that took place in 1475 in Florence for Giuliano de' Medici's coming of age. 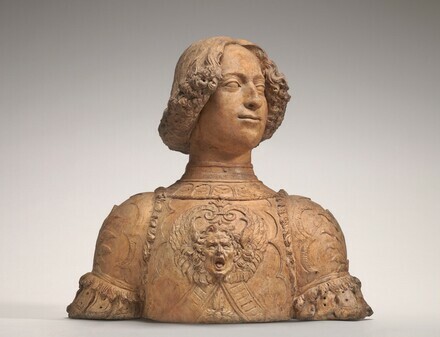 The bust was originally painted and possibly adorned with a metal helmet and other decoration, projecting an exuberance especially evident in the winged face modeled on Giuliano's fanciful armor. The beloved younger brother of the de facto ruler of Florence, Lorenzo the Magnificent, Giuliano was destined for an important future, a hope cut off by his dramatic murder during mass in Florence's cathedral, on April 26, 1478, in an unsuccessful attempt to overthrow Medici rule. Purchased 1846 in Italy by Eugène Piot [1812-1890], Paris. Louis-Charles Timbal [1821-1880], Paris, by 1866; Gustave Dreyfus [1837-1914], Paris; his estate; purchased 1930 with the entire Dreyfus collection by (Duveen Brothers, Inc., London, New York, and Paris); purchased 15 December 1936 by The A.W. Mellon Educational and Charitable Trust, Pittsburgh; gift 1937 to NGA. According to the prospectus about the bust prepared by Duveen Brothers, Inc., in NGA curatorial files. A drawing of the bust by Chevignard, placing it in Timbal's collection, was published in Le Magasin Pittoresque 34 (1866): 11-12, 41. The original Duveen Brothers invoice is in Gallery Archives (Record Group 12, Subject Files, box 2), copy in NGA curatorial files. Sculpture and Medals of the Renaissance from the Dreyfus Collection, Fogg Art Museum, Cambridge, Massachusetts, 1932. Renaissance Florence: The Art of the 1470s, The National Gallery, London, 1999-2000, no. 17, repro. Verrocchio's David Restored: A Renaissance Bronze from the National Museum of the Bargello, Florence, National Gallery of Art, Washington, D.C., 2004, not in cat., not shown at two earlier venues in Florence and Atlanta. The Portrait in Renaissance Italy: From Masaccio to Bellini, Gemäldegalerie, Staatliche Museen zu Berlin; The Metropolitan Museum of Art, New York, 2011-2012, no. 49, repro. Le Magasin Pittoresque trente-quatrième année (1866): 6. Bode, Wilhelm von. “Die italienischen Skulpturen der Renaissance in der Kőniglichen Museen, II, Bildwerke des Andrea del Verroccchio.” Jahrbuch der Kőniglich Preussischen Kunstsammlungen 3 (1882): 91-105, 235-267, esp. 266, proposing Giuliano de’ Medici as the subject. Heiss, Aloïss. Les Medailleurs de la Renaissance. Paris, 1885: 59, repro. Bode, Wilhelm von. Denkmäler der Renaissance-Sculptur Toscanas in historischer Anordung. 17 vols. plates; 1 vol. text. Munich, 1892-1905: text vol.:142-143. Mackowsky, Hans. Verrocchio. Bielefeld and Leipzig, 1901: 42. Venturi, Adolfo. Storia dell'Arte Italiana. 11 vols. Milan, 1901-1940: 6(1908): 715. Vitry, Paul. "La collection de M. Gustave Dreyfus: I. - La Sculpture." Les Arts 72 (December 1907): repro. 19, 22. Trapesnikoff, Trifon. Die Porträtdarstellungen der Mediceer des XV Jahrhunderts. Strassburg, 1909: 69, repro. Notice Lue a L'Assemblée Générale Annuelle de la Sociéte des Amis du Louvre (5 Février 1929): 5. "Notes from Abroad. The Dreyfus Collection - Other Notes." International Studio 97 (September 1930): repro. Mayer, August L. "Die Sammlung Gustave Dreyfus." Pantheon 7 (January- June 1931): 16, repro. Cortissoz, Royal. An Introduction to the Mellon Collection. Boston, 1937: repro. opposite p. 22. Jewell, Edward Alden. "Mellon's Gift." Magazine of Art 30, no. 2 (February 1937): 83, repro. "Mellon Offers Nation $19,000,000 Collection of Old Masters." The Art Digest 11, n. 8 (15 January 1937): repro. Planiscig, Leo. Andrea del Verrocchio. Vienna, 1941: 29. Preliminary Catalogue of Paintings and Sculpture. National Gallery of Art, Washington, 1941: 237, no. A-16. Book of Illustrations. National Gallery of Art, Washington, 1942: 253, repro. 238. Swarzenski, Georg. "Some Aspects of Italian Quattrocento Sculpture in the National Gallery." Gazette des Beaux-Arts 6th series, 24 (November 1943): 298. Duveen Brothers, Inc. Duveen Sculpture in Public Collections of America: A Catalog Raisonné with illustrations of Italian Renaissance Sculptures by the Great Masters which have passed through the House of Duveen. New York, 1944: figs. 139-142. Paintings and Sculpture from the Mellon Collection. National Gallery of Art, Washington, 1949 (reprinted 1953 and 1958): 129, repro. Seymour, Charles. Masterpieces of Sculpture from the National Gallery of Art. Washington and New York, 1949: 179, note 35, repro. 113-116. Pope-Hennessy, John. Italian Renaissance Sculpture. London, 1958: 311, fig. 82. Stites, Raymond S. "Leonardo scultore e il busto di Giuliano de' Medici del Verrocchio, 1." Critica d'Arte, anno X, no. 56: 1-32, fig. 1, fig. 25. Stites, Raymond S. "Leonardo scultore e il busto di Giuliano de' Medici del Verrocchio, 2." Critica d'Arte, anno X, n. 59-60: 25-33, fig. 6, fig. 7. Summary Catalogue of European Paintings and Sculpture. National Gallery of Art, Washington, 1965: 173. Seymour, Charles. Sculpture in Italy, 1400 to 1500. Harmondsworth, 1996: 178, pl. 115B. Clarence Kennedy. Exh. cat. Smith College Museum of Art, Northampton, 1967: 26, plate 76. "Renaissance." Gazette des Beaux-Arts 6e pér., vol. 69 (May-June 1967): 19. Richard, Paul. "Statue's Body Called Work of Leonardo." The Washington Post (Sunday, February 26, 1967): A1, A4, repro. A1. European Paintings and Sculpture, Illustrations. National Gallery of Art, Washington, 1968: 152, repro. Seymour, Charles. The Sculpture of Verrocchio. Greenwich, CT, 1971: 167, n. 15, fig. 152. Covi, Dario. "Review of G. Passavant, Verrocchio, translated by Katherine Watson, 1969." Art Bulletin 54, no. 1 (March 1972): 93. Souchal, François. "Charles Seymour, Jr. The Sculpture of Verrocchio." Chronique des Arts n. 1244 (September 1972): 26. Avery, Charles. Fingerprints of the Artist: European Terra-Cotta Sculpture from the Arthur M. Sackler Collections. Cambridge, MA, 1981: fig. 19. Alsop, Joseph. The Rare Art Traditions: The History of Art Collecting and Its Linked Phenomena Wherever These Have Appeared. Bollingen series 35, no. 27. New York, 1982: fig. 78. Walker, John. National Gallery of Art, Washington. Rev. ed. New York, 1984: 631, no. 983, repro. Darr, Alan Phipps. “Verrocchio’s Legacy: Observations Regarding His Influence on Pietro Torrigiani and Other Florentine Sculptors.” In Verrocchio and Late Quattrocento Italian Sculpture. Steven Bule, Alan Phipps Darr, and Fiorella Superbi Gioffredi, eds. (Acts of two conferences commemorating the fifth centenary of Verrocchio’s death. I. April 1988 at Brigham Young University, Provo, Utah; II. June 1989 at the Accademia delle Arti del Disegno and the Harvard University Center for Italian Renaissance Studies at Villa I Tatti, Florence). Florence, 1992: 136. National Gallery of Art. National Gallery of Art, Washington. New York, 1992: 291, repro. Stapleford, Richard. The Age of Lorenzo de' Medici: Patronage and the Arts in Renaissance Florence. A Walking Tour of Italian Painting and Sculpture in the National Gallery of Art. Washington, 1992: 5, repro. Sculpture: An Illustrated Catalogue. National Gallery of Art, Washington, 1994: 232, repro. Butterfield, Andrew. The Sculptures of Andrea del Verrocchio. New Haven and London, 1997: 230, 239-240, no. 29, pl. 273. Fenton, James. "Verrocchio: The New Cicerone." In Leonardo's Nephew: Essays on Art and Artists. New York, 1998: 56. Dempsey, Charles. "Portraits and Masks in the Art of Lorenzo de' Medici, Botticelli, and Politian's Stanze per la Giostra." Renaissance Quarterly 52:1 (Spring 1999): 24, fig. 14. Poletti, Federico. Antonio e Piero Pollaiolo. Milan, 2001: 201. Naldi, Riccardo. Andrea Ferrucci: marmi gentili tra la Toscana e Napoli. Naples, 2002: 217. Covi, Dario. Andrea del Verrocchio, Life and Work. Florence, 2005: 62, 131-137, 140, figs. 115-117. Carl, Doris. Benedetto da Maiano: A Florentine Sculptor at the Threshold of the High Renaissance. 2 vols. Turnhout, Belgium, 2006: 130, n. 27. Luchs, Alison. "Verrocchio and the Bust of Albiera degli Albizzi: Portraits, Poetry and Commemoration." Artibus et historiae 66 (2012): 85, repro.